The very latest title for Call of Cthulhu, Chaosium, Inc.’s RPG of Lovecraftian investigative horror, is strange for several reasons and quite possibly the strangest release for the game for some time. 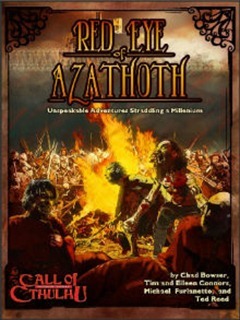 Red Eye of Azathoth: Unspeakable Adventures Straddling a Millennium is strange because it has been released not by one of the usual suspects – Chaosium, Inc., Pagan Publishing, Goodman Games, Miskatonic River Press, Super Genius Games, Cubicle Seven Entertainment, or even Pelgrane Press, but by Open Design, LLC. Which is a publisher better known for publishing Kobold Quarterly and various supplements for Paizo Publishing’s Pathfinder Roleplaying Game and Wizards of the Coast’s Dungeons & Dragons, Fourth Edition, especially for the Midgard Campaign Setting and its Free City of Zobeck. Second, it is strange because this experience with the Dungeons & Dragons format informs the feel and style of Red Eye of Azathoth throughout. Third, it is strange because although Red Eye of Azathoth adheres to the traditional onionskin format so beloved of the Call of Cthulhu campaign, it does not arrange its slivers of onionskin location by location, but time period by time period. Fourth, each of the five scenarios that comprise Red Eye of Azathoth can each be played through in order as a campaign, or as a series of one-shots in any order. Fifth, Red Eye of Azathoth is strange because it is only available as a PDF, physical copies only being available to patrons of the project at Open Design that eventually became Red Eye of Azathoth. The five parts of Red Eye of Azathoth are in turn set in Dark Ages England, early Medieval Japan, Renaissance Spain, the New World, and the Wild West. What these disparate times and places have in common are the effects of the garish, gaudy glow of a ruddy comet the passing of which leaves in its wake, death, destruction, madness, and chaos. In each of these times, the adventurers find themselves confronted with strange situations and presented with mysteries, each of which takes a series of flashbacks to understand, the number of flashbacks growing as the campaign progresses. It is these flashbacks and the information and skills that they impart that together make up the campaign’s primary clues. Thus by the end of the fifth and final chapter, the adventurers will have learned what is really going on. Not only are all five of the scenarios in Red Eye of Azathoth written for use with pre-generated characters, they are also written to be played with four participants. In some cases, the scenarios suggest how another player could be added, but not always. Further, the issue of creating new characters is not really addressed as part of the campaign, though new skills are explained. This necessary because this quintet is set entirely outside of the time frames discussed in Call of Cthulhu. In fact, the two sources that Red Eye of Azathoth draws from for its rules are actually out of print and unavailable, being the otherwise disappointing Cthulhu: Dark Ages and still the best treatment of its subject, “The Good, the Bad, and the Utterly Insane: Call of Cthulhu in the Wild West,” which appeared in Pegasus Press’ Worlds of Cthulhu #2. Red Eye of Azathoth opens with a bloody bang, in media res, with “That Which is Dead Shall Refuse to Lie.” It is Walpurgis Night, Sunday April 30th, 887 AD on the tidal island of Lindisfarne, Northumbria, and the famed monastery has been stormed by a Viking raiding party. Under a blood red sky and before rising seas, the four adventurers – two Viking pagans and two enslaved Christian monks, must overcome their natural mistrust of each other to face a sorcerer that they can all see on top of the monastery’s tower. This is bloody affair, gorier than most Call of Cthulhu scenarios, the need to enter and explore the monastery to get to the final showdown and the number of combat encounters, make it all read very much like a dungeon. Apart from the dangers present in the scenario itself, the initial danger is that the Viking characters will overplay the master-slave relationship that the scenario opens with, possibly hampering the investigation later on. Still, this gets the campaign off to a start with a bang. It is followed by “The Silence of Thousands Shall Quell the Refrain,” which is set in Japan in 1287 AD. This places the investigators in the pre-samurai era with their being sent to study the marvellous village of Iwaizumi, which come war, famine, or typhoon has always been able to pay its tribute to the emperor, and this without petitioning the throne on any matter in return. The curious reputation of the village is exacerbated by the curious nature of villagers, everyone one of them silent and illiterate. This sets up what could be a stumbling block to the easy running and playing of the scenario in that the villagers communicate through the use of sketched pictograms. The Keeper is encouraged to act this out between the player characters and the NPCs, a process that could grow wearisome all too quickly. Fortunately, the scenario does feel that long, but again, like the scenario before it, “The Silence of Thousands Shall Quell the Refrain” is a combat orientated adventure. This is not to say that there is no investigation involved, but the real issue with the scenario is that unlike its predecessor, it really does feel like a generic Dungeons & Dragons scenario, one that could be set elsewhere, let alone early medieval Japan. Effectively that of there being a village under threat and the adventurers must deal with the threat, though the twist at the beginning is that the village of Iwaizumi is at least initially mysterious rather than obviously dangerous. The middle scenario though, is more interesting, at least historically. “Fires of Hatred Defile the Sky” takes place in Valencia, Spain in 1487 AD at the height of the Spanish Inquisition. The descent of three angels upon the city has been taken as a blessing by the “Grace of Valencia,” Bishop Esteban del Cassandro, to root out every non-believer and heretic in the city. As the scenario opens, each adventurer finds himself gagged and hooded, under arrest and held by the Inquisition. The adventure involves the characters finding allies and avoiding being subject to inquisitive torture, their escaping the prison, all already with a good idea as to who the scenario’s antagonist is. Proving it is not just another matter, but also the point of the scenario. Doing so, involves a chase sequence before breaking into the antagonist’s quarters. If there is an element in “Fires of Hatred Defile the Sky” that feels at odds with Lovecraftian investigative horror, it is the inclusion of magic that feels more Euclidean. For example, one investigator knows how to construct a golem whilst another can command snakes and even transform himself into a snake. Lovecraftian Purists are unlikely to appreciate this, and Dungeons & Dragons players will probably be dismayed at the lack of spells. Ultimately, their inclusion does feel out of place providing as they do too easy a solution to some of the situations presented in the scenario. The lost colony of Roanoke is no stranger to Call of Cthulhu, having previously been visited in “Whispers from the Abyss” in the Theatre of the Mind Enterprises’ anthology, Whispers from the Abyss and Other Tales – pleasingly acknowledged in the text of the fourth scenario. Set in 1587 AD, “Lost Shall Be Those Bearing Souls Split in Twain” finds the adventurers crossing the Atlantic to join in the colonisation efforts spearheaded by Sir Walter Raleigh in the New World. Upon arrival, they and their fellow colonists find the existing settlement abandoned, which sets up the scenario’s first mystery and first problem. That is, what happened to the former inhabitants and was it something to do with the indigenous peoples native to the region; and how will they survive the all too imminent winter? At least looking into the first problem will bring the newly arrived colonists into contact with the natives, and here the scenario’s tension lies – dealing with one or more peoples whose relationships with new colonists’ predecessors threaten their own relationship with the native. This is all the whilst both the colonists and the natives are haunted by creature out of legends of the New World. Unlike the previous scenarios, “Lost Shall Be Those Bearing Souls Split in Twain” is a more event driven adventure and by setting it on the edge of the New World, it also feels less confined than the previous adventures. There is also less of a reliance upon the format and play style of the Dungeons & Dragons scenario, it is less combative in nature, and ultimately, less linearity. Red Eye of Azathoth comes to a close in the “Weird West” of the Arizona Territory of 1887 AD. “And Madness Shall Rise to Devour the West” opens with such a shuddering bang, it behoves me not to spoil it for any potential player. Once the scenario gets moving, the investigators must make their into the isolated township of Desperation to find its inhabitants harrowed by hunger and the perpetual sandstorm that rings the town, and the town itself under the control of several fierce Marshals with a tough approach to law enforcement. After the more traditional feel of a Call of Cthulhu scenario in “Lost Shall Be Those Bearing Souls Split in Twain,” this scenario reverts to the pattern by the first three adventures and is more combative and explorative in nature. Given the modern era of the setting, it would seem natural that this combative aspect would involve firearms, and indeed the scenario does. Yet there is an effect within the scenario that prevents their working, forcing the investigators to rely upon their comparatively weak melee skills. It seems so odds at the setting to remove something so intrinsic to it. Another issue with “And Madness Shall Rise to Devour the West” is its change of tone compared to the earlier scenarios; it is inherently pulpy with super competent investigators two of whom possess several spells. The influence of the Dungeons & Dragons format on the feel and style of Red Eye of Azathoth shows most obviously in the characters and the campaign’s physicality. It is important to stress the difference between the characters of Red Eye of Azathoth and the investigators of Call of Cthulhu. In Call of Cthulhu, the investigators are ordinary men and women of varying degrees of competence though rarely what might be called super competence, especially when it comes to combat. Whereas the “investigators” of Red Eye of Azathoth owe more to high level adventurers of Dungeons & Dragons in terms of skills and combat expertise, rather than arcane or divine abilities, although several of the pre-generated adventurers possess both spells and knowledge of the Mythos. Their skills are thus high – though this often matched by the capability of the antagonists – which when combined with the lack of traditional investigative processes, makes the “investigators” of Red Eye of Azathoth more like adventurers. Further, without those traditional investigative processes, the means of resolving the five scenarios takes on a more physical, more combative nature. It should be noted that the structure of the campaign and its use of different adventurers in each time period also impacts on the campaign in interesting ways. In the traditional onionskin campaign, an investigator’s Sanity is whittled down as the events of the campaign progress, such that there is often a loss of player characters due to deleterious effects of encountering the Mythos. In Red Eye of Azathoth, this is avoided because essentially, the characters are refreshed from one scenario to the next. Though to an extent, the traditional Sanity whittling is countered with some quite strong Sanity losses within the scenarios themselves. Red Eye of Azathoth also avoids the loss of knowledge common to other Call of Cthulhu campaigns that would come with the death of investigators with the flashback mechanic, though they still begin each scenario unaware of who the campaign’s villain is and of course, who he will be in each scenario. The structure of the campaign also expects a little more of the Keeper. Naturally, the protagonist is working to achieve certain objectives, but in each scenario, the adventurers have the opportunity to curtail certain elements of these. So a Keeper needs to maintain a track of what the adventurers have done or not done in one adventure, as this not only has an effect during the subsequent adventures, but also on the campaign’s finale. Essentially, by campaign’s end, the Keeper will have assembled a check list in which he needs to have checked off what the investigators have done and determine how well they will have done overall. Physically, Red Eye of Azathoth is a clean and tidy looking book. Oddly, it is actually better for a Keeper to own the PDF version of the book, rather than the printed version. This is because the PDF makes use of colour, making it easier to read, especially the maps. In the printed book, they are sometimes too dark to read. If there is an issue with the book, it is that it needs another edit just to tidy it up. Ultimately, it is difficult not to read Red Eye of Azathoth as a Dungeons & Dragons campaign written with the drier, less forgiving set of rules in Call of Cthulhu. There should be no criticism inherent to such a concept, but in the execution as evidenced by this mini-campaign, the result is not wholly satisfying. The individual scenarios themselves feel too short and often too linear; the antagonist too fleeting a figure until the climax of each scenario when the investigators get a chance to beat him up; and the campaign often a little too fantastic in the way that the characters are designed. This is not to deny the interest that lies in exploring the settings and period of at least the first four scenarios or in the way in which the first four scenarios are set up. Similarly, the means of passing information from previous scenarios to the latest is interesting and well done, helping to get past the issue of dealing with player knowledge (though to help work against player knowledge, I would suggest that initially they only be told that they are playing one-shots rather than a campaign). For some players, Red Eye of Azathoth: Unspeakable Adventures Straddling a Millennium is just going to be too different a campaign for them to play, whether they normally play Call of Cthulhu or Dungeons & Dragons in their classic styles. For Call of Cthulhu, it is too pulpy and too reliant on combat to deal with its threats, whilst for Dungeons & Dragons, the investigators are probably too weak and the settings not quite fantastic enough. Given the campaign’s source, it is no surprise that its influences are worn so readily, and if both players and Keeper can embrace both these influences and the campaign’s structure, then there is an interesting experience to be gained from playing through the campaign. Whilst those influences and its structure is always going to make it a stranger when compared to other campaigns, Red Eye of Azathoth: Unspeakable Adventures Straddling a Millennium is nevertheless a brave attempt to do something different with the classic Call of Cthulhu campaign.